Vincent Ramos acknowledges local history by paying homage to the rich cultural contribution of the El Monte Legion Stadium. The stadium was a hot bed of activity in its heyday. At a time of severe racial divide, the live music and sporting events that took place there brought people of all races and colors together from all over Southern California. This integration transcended the physical audience at the site into the mediums of radio and television. This artwork focuses on the musicians who played at the stadium and the promoters (radio deejays and TV personalities) who organized and hosted these events. The individuals represented in the artwork reflect the early worlds of rock n’ roll, rhythm and blues, and country music. References to some of the popular sporting events that were held there at that time are reflected such as boxing and roller derby. The designs are built on the circular shape of a 45 RPM record. This is not only a direct reference to the music but also a metaphor for continuous movement, of transcending eras to of move forward with this history and knowledge in tow. She image of the record is also meant to graphically mimic the bus tires that are constantly maneuvering throughout the station. VINCENT RAMOS received a Master of Fine Arts from the California Institute of the Arts and a Bachelor of Fine Arts from Otis College of Art and Design. 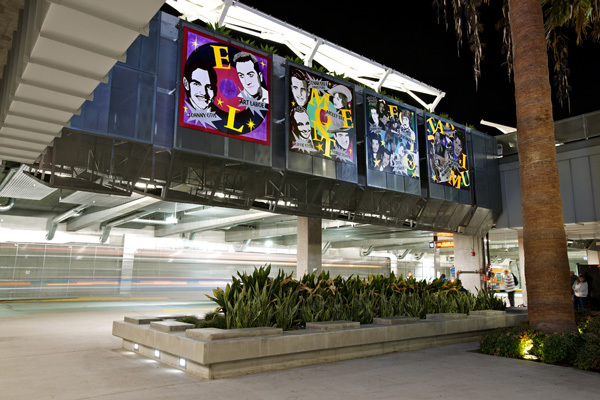 His artwork has been included in exhibitions at venues that include the Hammer Museum, LAXART, Las Cienegas Projects, and 18th Street Art Center. Ramos is a recipient of a California Community Foundation Emerging Artist Fellowship and his work is included in the permanent collection of the Hammer Museum.